Jus' Restin #265 is a relaxing and fully furnished two story mountain cabin located right in the downtown Village area so you are within a short walk to bars, dining, shopping, or entertainment. The entry level living room is very relaxing and comfortable, providing nice furnishings, a gas fireplace, a TV/DVD player with extended cable, plus there is an additional family room area with additional TV and comfortable sitting couch. There is an equipped kitchen with essentials for cooking, basic appliances and cookware and breakfast bar and a small table for seating are available. The massive master suite is the entire 2nd level of this awesome home, and boasts a full bath with jetted spa tub and a separate shower for your enjoyment, while the additional sleeping quarter is on the lower entry level. 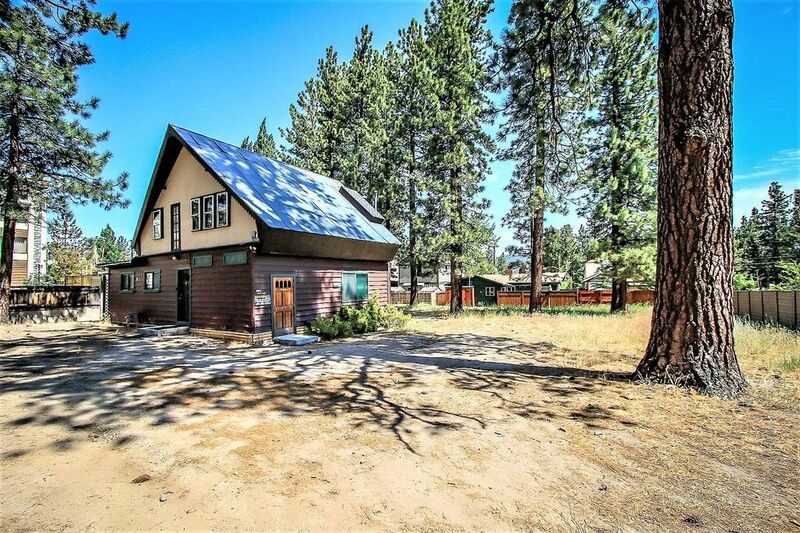 Jus' Restin sits on a large property with privacy fencing and a great snow play area, plus offers a natural gas BBQ and outdoor picnic table for your enjoyment, making this home the perfect place to spend your next Big Bear vacation! We went up with a small group of friends to relax and it was in the perfect location. Right next to the village and walking distance to the docks and water activities. Great place to stay with a group! Private lot for parking and plenty of space inside. The only issue we had was it got alittle hot inside, but just open up some windows! We were very glad to book this home and would definitely recommend. Thank you for sharing your voice. You review is very appreciated and the details have been shared with our Team and Leadership. We are always striving for greater excellence and seeing through the eyes of our Guests is very helpful! We are looking forward to helping you plan your next visit. The Cabin was located in the village which was really nice and had a great big backyard for the kids to play, but the house was filled with ants and was not very clean. The upstairs plumbing was clogged and water would sit in the sink. The cabin really needs an upgrade. Thank you for sharing your voice. The lake levels have gone up rapidly after the wonderful wet winter we have had. It has become apparent that the small inhabitants of the shores are looking for new homes (ants and such). We are working very hard in conjunction with our Owners to counter measure this. We appreciate the feedback and have shared it with the Team. You are important! We hope you do come for another visit soon. Big Bear Vacations offers over 350 wonderful Vacation Homes to choose from. Showers were very slow to drain and water pressure was a little weak, but wouldn't keep us from renting again. Stairs to upper bedroom are entirely too steep, too narrow front to back and handrail is insufficient. Husband slipped on top step and tumbled down all 14 steps to bottom--extremely fortunate he was not badly hurt, but definitely need to warn people about it and put another handrail on right side going up. The location is awesome. The cabin is tucked away in the heart of the Village. You can walk to Coffee, breakfast, lunch and dinner. Its only a 5 minute drive to the Ski Slopes. The Cabin has everything it needs, but the Cabin is Old. For the price, it delivered what was advertised. However, it needs a modern touch of technology. No wifi, old TVs and small equipment. Like visiting your grandparents house. Thank you for posting such a relevant review. You really nailed it! What you typed is parallel to our own rating of this property ~ which is "Big Bear Cozy". It really is in an excellent location. Your comment about internet has been dully noted and forwarded to the Owner of the property. Of course it is at the owners discretion to provide this. We do hope to see you and yours again very soon!